You can’t write about energy debates in New Hampshire without writing about the largest provider of electricity in the state – Public Service Co. of NH. This is not an anti-PSNH post, they already have enough people calling for their heads and I am uncomfortable among crowds. I have known and worked with too many good PSNH employees to want to “pile on” with criticisms and even if I did the company has too sophisticated a public and community relations operation to be concerned with the writings of a blogger. By way of disclosure, I am not currently involved either professionally or personally in any issue that directly affects PSNH. I am, however, intensely interested in energy markets and energy policy in NH and the nation. The NH Public Utilities Commission and Public Service Company of New Hampshire have sharply differing views on the outlook for the electricity market and what should be done about it. Whichever view is deemed more accurate by the PUC will likely determine the how electricity markets are regulated and deregulated in NH in the coming years. In this post I look briefly at the most prominent issue facing customers, regulators, and PSNH, and the issue at the heart of what will be the most important policy debates (no offense Northern Pass proponents and opponents) over the electricity market in the state. For decades electricity markets were affected much more by large commercial and industrial customers than by residential customers but that has chganged. 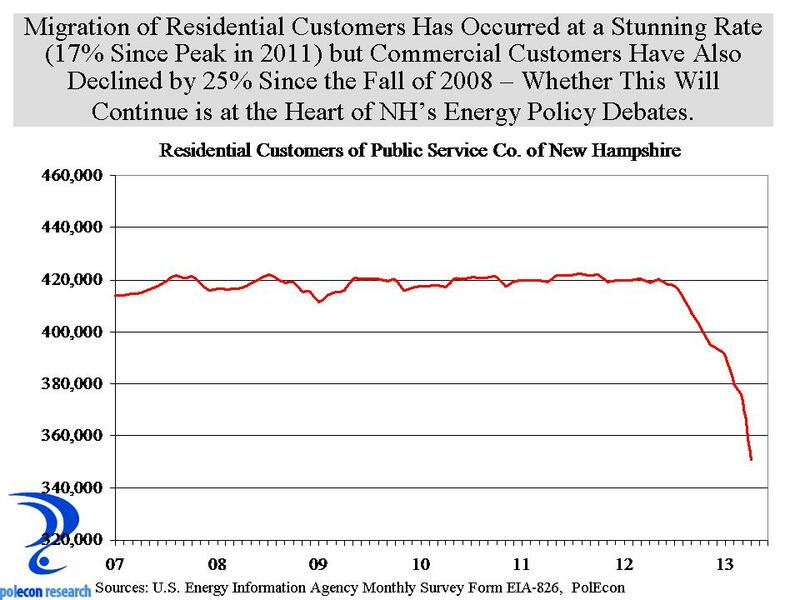 As I suggested at the beginning of the year in my post “The Coming Consumerism of Residential Electricity Customers”, competition for residential electricity customers would likely accelerate in NH. 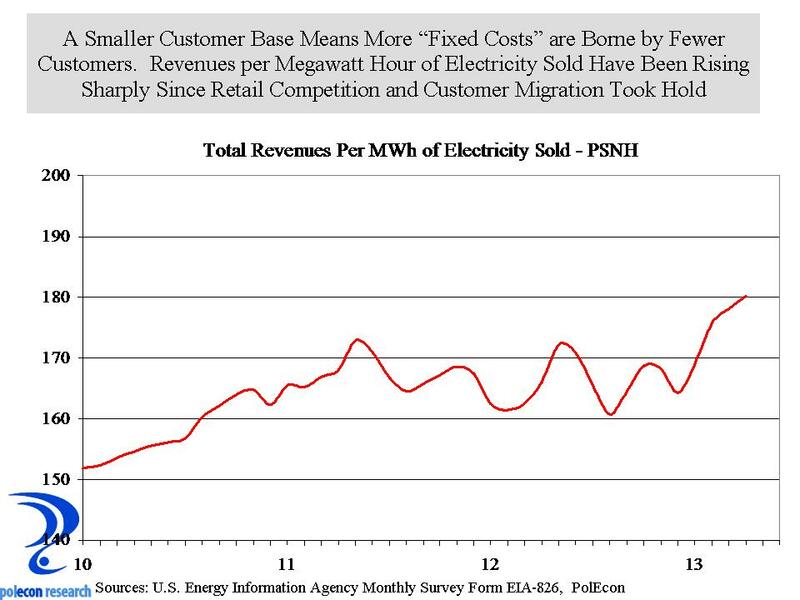 As the chart below indicates, the migration of residential electricity customers away from PSNH has been accelerating and the implications are enormous. As PSNH’s electricity customers switch to competitive suppliers revenues decline, and more importantly for the future of the market, the customer base shrinks. For a company like PSNH with high “fixed costs” in electricity generating plants and other system costs, these fixed costs do not shrink with a reduction in electricity sales or a decline in the customer base . The result is that fixed costs are recovered from a smaller number of customers which of course leads to higher prices and a further migration of customers and still greater costs for the smaller number of customers of that remain. For an electricity provider with high fixed costs and a regulatory system that allows those fixed costs to be recovered from its customer base, revenues will not decline in proportion to declines in electricity sales. As the chart below shows, the decline in PSNH’s electricity sales has been much larger than has been the decline in its revenues from electricity sales. 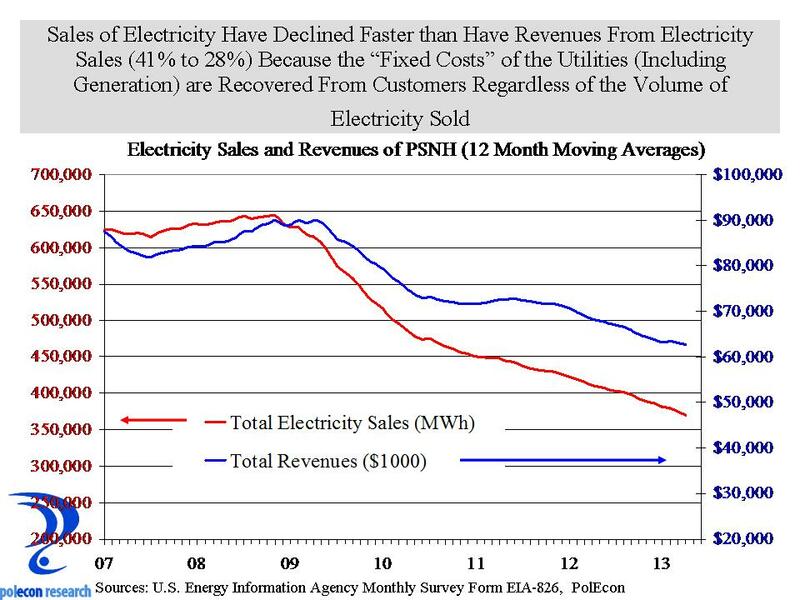 When revenues decline more slowly than do sales of electricity, the revenue derived per unit of electricity sold increases, despite a decline in both sales and revenues. That can temporarily help cushion an electricity provider from the impacts of declining customers and sales but is not a sustainable long-term strategy or good thing for customers and the economy. It seems that both PSNH and the Public Utilities Commission agree on that. What they don’t agree on is how long these trends will last, how far they will go, and most importantly, what to do about them. Some of these issues will be topics of future blog posts. This entry was posted on July 9, 2013 at 1:04 pm and is filed under Electricity, Energy, New Hampshire, Policy. You can subscribe via RSS 2.0 feed to this post's comments.